is evident at all levels of our company. SBS Construction strives to minimize the environmental impacts of its operations through consistent improvements that address environmental management and performance. We continually strive to provide greener solutions for our clients. Working within an environmental framework is critical to the successful delivery of projects. SBS has proven our ability to put sustainability at the forefront of our construction projects, and employs many sustainable strategies as part of our everyday practices. 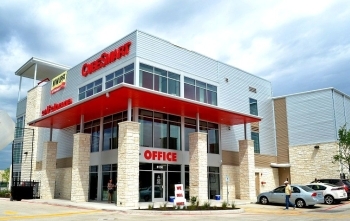 SBS Construction achieved net-zero status with its constructed CubeSmart facility in Austin, Texas. The property incorporates a variety of energy-conserving features, including LED lighting and solar panels. Branded and managed by real estate investment trust CubeSmart, the project is the first net-zero storage site in the city. UPDATE: 1/15/2019 – This Project has received a LEED Platinum rating, the only building in Texas to receive this certification. All of these elements combine to achieve a net-zero energy result. Initially, the property will actually be energy-positive, meaning it will produce more energy than it consumes, until the second building is constructed.